I had the pleasure of attending my very first Monster Truck event with my daughter and her two friends. What and event…it was just amazing! I had never seen monster trucks up close or in action and neither had my daughter. Before the show was over…my daughter was asking me if we could go again. The event started out with a Pit Party. 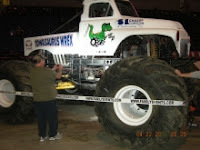 We were able to walk around and visit the drivers of each monster truck, obtain their autographs, and take pictures up close of the monster trucks. All the drivers were personable and very engaging with the kids. 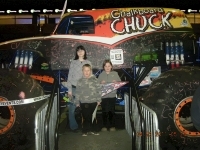 The kids got to write on Chalkboard Chuck at the bottom of the chassis and on the tires. Participating trucks included, Chalkboard Chuck, Star Marshal, Towasaurus Wrex, Stabilizer, Air Dog…Air Dog’s driver is a woman…how cool is that? I really wanted to see her drive; however, the arena would not allow her to drive this time around. It was heard through the grapevine this was due to her truck running diesel fuel. The show included an entertainer…Porkchop. Porkchop rode this bike that you would see a two year old on. He was too funny. He wore different head pieces throughout the night, and even had a glove like Michael Jackson’s he wore as he danced to the song that has the moon walk. Let the contests begin! Okay…so mind you, I had no idea what to expect from these trucks. I had no idea what the contests were all about. I couldn’t begin to see how they would crush 2 rows of cars, with 5 cars in each row, given the amount of floor space. Well, one by one, the trucks took part in each contest. By the end of the night…these cars were demolished…crushed…worth nothing other than to recycle the metal. If I got it right…Big Foot won all of them…don’t mark my words though, but I heard ‘Big Foot’ several times when they announced the winners of the contests. There was a ‘free for all’ segment of the show where the trucks just did what they wanted. Then, we all witnessed the trucks taking turns at crushing one of their mother in laws car. It was smooshed like a pancake! Near the end of the show Porkchop asked if there were any kids ages 4-7 yrs. old in the audience who did NOT own a bike of any kind. Once he found a child meeting the criteria, he brought him down on the floor. He confirmed with this young boy how old he was and his name. The boy said he was seven. His name was Jose. He then confirmed with Jose if he owned a bike. Jose said no. Porkchop then asked Jose if he could ride a two wheeler. Jose said no. Porkchop had Jose get on the bike, and try to make a go of it. Jose was having a bit of a time…not to worry though, Porkchop made it all okay. By the time all was said and done, Porkchop announced to Jose the bike was his. Jose jumped around with joy. Chills ran through my body…it was very touching to see a young boy who doesn’t own a bike be given one that’s been used in an event like this. 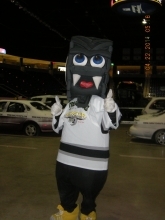 I almost forgot about the mascot of the Pit Party! His head was the shape of a “BIG” tire. And, I am very glad I wasn’t wearing that tire,as I can’t begin to imagine how his neck must have felt by the time he got that tire off! We had a fabulous time at the Monster Truck Nationals. If you get a chance to see them when they come to your area – it’s worth it. There next stop is April 29 & 30 at the Tullio Arena in Erie, PA. Sounds exciting, I have to admit I'm fascinated somewhat by monster trucks. I often wish I was driving one in a traffic jam LOL. @ Clairity…that's a great thought!